Rehema Ministry currently focuses its ministry to equip vulnerable children with basic education at primary school level (DRC03). While the present support programme is extremely valuable to the parents/caregivers and children, offering these vulnerable children a chance to attend secondary school will be an incredible help as it will lead them to a vocation that will sustain them in life and keep them away from the danger of going onto the street where their future may be completely ruined. 1) Primary school (6 years) where children are introduced to basic skills on issues such as languages, science, technology, hygiene, writing, reading, counting, environment, moral, etc. This partnership is a scholarship support programme to assist vulnerable children into secondary school. Priority will be given to children who have graduated from primary school within the Rehema programme although the programme will be open to other vulnerable children according to the availability of funds. Not all those who finish primary school would go on to secondary school however many bright young people do not get the chance as there is just no money available. This pool would be composed of a maximum of 20 children. Since 2010 Bright Hope World has been partnering with Rehema Ministry to support 60 children per year to attend primary school (DRC03). Over that time Rehema Ministry has supported 102 vulnerable children. Among them 18 have left Bunia as their parents relocated to other villages for ministry while 24 graduated to secondary school. These 42 children do not qualify for the current Rehema Ministry support programme. Among the 24 children who graduated from primary school, 17 remained in Bunia. Out of the 17, only 7 went to secondary school as most parents/caregivers could not afford secondary school costs. In July 2014 when BHW's Field Director visited DR Congo, George expressed a desire to start helping some secondary students. This discussion continued and in October 2014 a decision was made to commence a partnership assisting students to secondary school. The vulnerable children on the Rehema programme who complete primary school and their families are the beneficiaries here. The children enrol to secondary schools that offer vocational training based on their preference and their academic aptitude. Secondary schools available in Bunia include schools offering Theology, Chemistry and Biology, Mathematics and Physics, Literature, Business Administration, Social Work, Nursing, Agriculture, Veterinary Science, Nutrition, Mechanics, Electronics, Construction, Geology, and Education. These schools organize both theory and practice where internship is mandatory. Secondary school graduates have the ability to start their own business or get employment in shops, hotels, NGOs, primary schools, clinics, churches, offices, etc., where they are managed mostly by university certificate holders. There is no medical insurance in DR Congo and retirement benefit is still a struggle. Employment provides a better future for children who are also the main source of support to parents when they get old. The Rehema Ministry works in close collaboration with the churches from where the children are selected, with the schools where the children are studying and also with the parent/caregivers of the children. They have a real love and concern for the children they care for and a real desire to help these children out of their poverty stricken lifestyle. They are also seeking to encourage and strengthen the children spiritually. 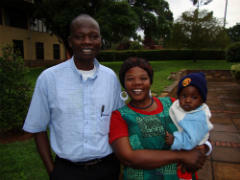 George and Jacqueline Atido coordinate the ministry. Jacqueline has a Diploma in Education and George a Bachelor in Education and MA Missions. He graduated from Nairobi International School of Theology in 2005 and then served with Nguluni Bible Chapel as a missionary for two years before they returned to DR Congo. They have three children. The Rehema Secondary Pool will be administrated by a pool facilitator, Justin Pitua. Justin is 32 years old and is married with two children. He has been a secondary school teacher for six years and a church elder for four years. He is a very reliable man, has a real love for children and is a good collaborator. Justin will receive the funds and distribute them to the schools where the selected children are enrolled. He will also collect payment receipts and the children's performance reports from the schools. He will visit the children’s parents from time to time. The role is a volunteer one and he will report to the Rehema director. In the long term they would like to start up their own Christian school for not only vulnerable children but also for children whose parents are able to pay for their schooling. In the short term they seek to do this by helping parents pay for school fees, uniforms and books for needy children and working with the church and parents to implement this. A secondary school that trains students in non technical skills such as Education, Literature, or Theology would cost approx US$150 per school year while a school that offers technical skills such as Electrician, Construction, or Nursing would cost approx US$200 per year. In 2014/15 BHW will support 10 students to commence a secondary education with an additional five students being added in 2015 and a further five in 2016. We will support these 20 students through their six years of secondary schooling and as some students finish more will be added to the programme.